Acoustic fingerstyle lessons from a pop-rock standpoint. If you're a rock player and the world of acoustic fingerstyle has always seemed foreign and hard to grasp, have no fear. 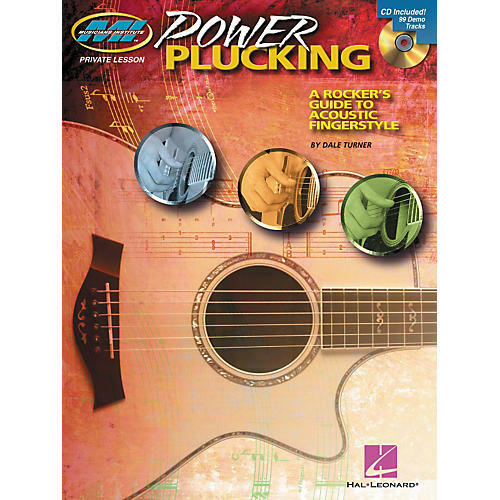 The Power Plucking: A Rocker's Guide to Acoustic Fingerstyle Guitar book and CD set teach the technique from a purely pop-rock standpoint. You won't waste time here learning classical pieces you don't want to know. This instructional book concentrates its tutorials on the type of riffs you've heard from all your favorite artists, including Jimmy Page, James Taylor, Elliott Smith, John Frusciante, Eric Clapton, Jeff Buckley, Nick Drake, etc. You've never felt this comfortable exploring new musical territory.